The complete renovation had to take place while the NOMA team was in London during the Olympics, leaving us a total work period of less than three weeks. Time was a challenge in itself, but also the fact that the NOMA is located in an old listed warehouse building presented a lot of restrictions. Working with NOMA for so many years has created a mutual respect and understanding of both the space, but also the mindset, values and preferences of all the people involved. That makes dialogue and communication very easy, which is always very valuable for a creative process. But in the beginning we all thought that NOMA should be turned upside down, that we should do something completely new and unexpected. After quite a long initial sketching period, we all came to the conclusion that it seemed forced and pretentious for a place like NOMA to do something too conceptual or formally upscale — whether it was modern, nostalgic or a combination of the two. 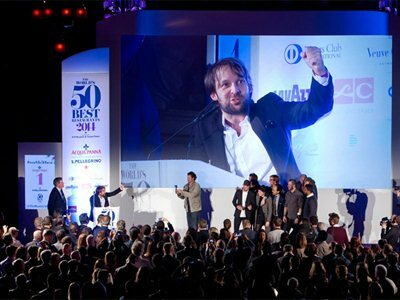 Rene Redzepi defined his vision: it is important that the space is not perceived as a superficial layer between the costumer and the actual food experience. We decided to respect and protect the existing atmosphere of NOMA, but work carefully with the space and functional elements in terms of detailing, tactile surfaces, colours — more or less as a 1:1 mood board of samples, wood, stone, leather, textiles, furniture. a balance between the rough and the refined detail and elegance. We built a brick wall in the lounge and changed the entire floor to a beautiful oak floor from Dinesen in falling width, which made a huge difference in atmosphere. Apart from not doing a lot of actual construction on site, we changed almost anything else. All the furniture, surfaces, curtains, painted surfaces, toilets have been completely changed or renovated. Especially the lounge area involved quite a lot of construction. We build a long brick wall facing the rest of the building to get a more defined lounge space, and the long massive bar was replaced with spatial elements in grey wood and brass – mounted at the columns which creates a completely different flow and openness of the space. 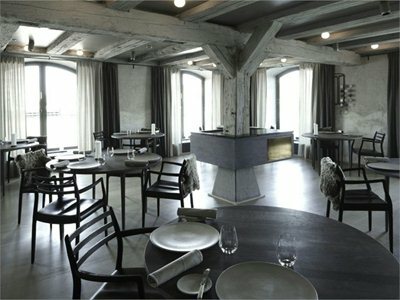 The chairs and tables in the restaurant are the same design as in the original Noma, but we changed the surfaces and colors. The Chair is from J.L. Møller and the tables we designed ourselves. But in the lounge we changed all the furniture, and here we used the Ren Chair and Sofa which we recently designed. The Ren Chair is a part of a completely new collection we have made and launched in collaboration with Stellarworks. For NOMA we had a modified version made for the new lounge in a different lowered height and materials to accommodate lounge seating dimensions as well as designing a two-seater sofa to complete the area especially for this project. The chair reflects values that we feel match and complement the aesthetics of Noma. It is a genuine honest chair with high detailed features in black solid wood, brass and black leather. The chair has an organic shaped body and fine detailing in brass, it picks up the tradition of classic Danish design, but also shows a curiosity towards other cultural points of reference, sampling Asian features into the design. The intention is through choice of materials and surface finishes that the chair patinates and builds character over time when being worn.